Actuated valve, also referred as shutdown valve, blowdown valve, on-off valve, mainly comprises of valve body and actuator. Here are several accessories that make actuated valve complete. Comprises of a solenoid and a valve which form is usually a three-way valve. Solenoid converts electrical energy to mechanical energy resulting three-way valve changes its state. Refer to the lower box in schematic when there is no electrical current received by the solenoid (in other word “de-energized”), the spring makes the valve in a state of the inlet port (1a) blocked while the outlet port (1b) connects to the vent port (1c), releasing air inside the actuator to the atmosphere. If the solenoid is energized by electrical current, it will change the valve state. Refer to the upper box in the schematic, the inlet port (1a) connects to the outlet port (1b) allowing the air supply flowing into the actuator and stroking it, while the vent port (1c) is blocked. *fail safe mode means that the actuated valve shall bring the system to safe condition when instrument air or electrical starts to fail. Shutdown valve (SDV)shall be closed, or referred as FAIL CLOSE, whereas Blowdown valve shall be opened or referred as FAIL OPEN. 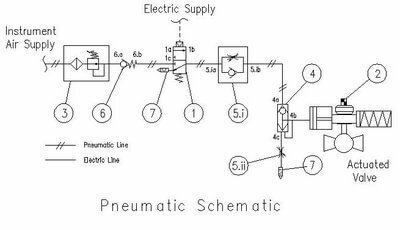 In some application where there is no electrical power, pneumatic piloted valve is used in lieu of solenoid valve. It has the same principle as solenoid valve, but the power source is pneumatic instead of electrical. Position transmitter is used to remotely monitor valve opening from the control room. This instrument is attached on the actuator and transmitting analog electrical signals to indicate the exact position of valve opening. Meanwhile limit switch can only provides remote indication of valve status (open or close position) through electrical discreet signal. This device filters the air supply and regulates its pressure, resulting clean air supply with constant pressure fed into actuator. Quick exhaust valve can increase the reaction of actuator spring when valve is required to fail safe. This is achieved by releasing the exerting fluid inside the actuator into the open line (port 4c), rather than back through the supply line (port 4a) which is more restrictive as it has to pass flow regulator valve and solenoid valve. This valve regulates flowrate of air supply in one direction only, while it doesn’t regulate the flowrate of air supply from other directions hence full flow will be passed through. It is used to set the opening time of SDV or closing time of BDV. During start-up the actuator is stroked with rate of movement depends on air supply flowrate flowing into the actuator. FRV will restrict the flow from (5.ia) to (5.ib) resulting the flow rate of air supply into the actuator decreases so that the actuated valve will move slower. If the actuated valve is required to fail safe, the air supply shall be vented from the solenoid vent port (1c). The uni-direction FRV will keep full flow from (5.ib) to (5.ia). Unlike uni-directional FRV, bidirectional FRV applies restriction to both directions. Installing this FRV will set the time required by the actuated valve to change its state to safe position. It allows flow from one direction only i.e from (6a) to (6b). Commonly check valve is used to protect the upstream equipment from back flow. This prevents bug or dust entering the pneumatic system from ports open to the atmosphere.